The Qingming Festival (simplified Chinese: 清明节; traditional Chinese: 清明節; pinyin: Qīngmíngjié, Ching Ming Festival in Hong Kong, Vietnamese language: Tết Thanh Minh), Clear Bright Festival, Ancestors Day or Tomb Sweeping Day is a traditional Chinese festival on the 104th day after the winter solstice (or the 15th day from the Spring Equinox), usually occurring around April 5 of the Gregorian calendar (see Chinese calendar). Astronomically it is also a solar term (See Qingming). The Qingming festival falls on the first day of the fifth solar term, named Qingming. Its name denotes a time for people to go outside and enjoy the greenery of springtime (踏青 Tàqīng, “treading on the greenery”) and tend to the graves of departed ones. Here’s a article from global times, may help you better understanding this particular festival and give a suggestion to plan your Qingming Festival holiday. The Tomb Sweeping Festival is not only an occasion to commemorate death, but a happy break for those who remain alive. Apart from the obligatory visitation of the burial grounds of deceased family and friends, having a good plan for the break is also necessary. Lifestyle has advice for those who need a simple, short-term escape from Beijing. If you want to find a place to relax and have no intention of exhausting yourself with physical exercise, during your vacation, you may wish to consider Hongluo Temple. Located in Huairou district, 55 miles from Beijing, the temple grounds occupy around 800 hectares, making it the biggest Buddhist forest in northern China. 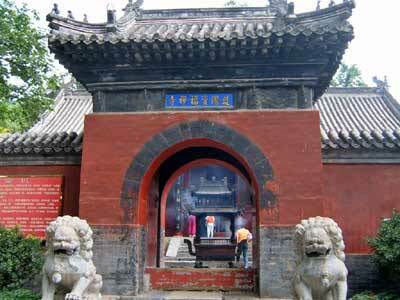 The temple was originally built by a monk named Fo Tudeng in 338 AD, the first acknowledged teacher of Buddhism in China. Now the temple has become one of the most popular national scenic spots; visitors include the emperor Kang Xi, who stopped by during his travels in 1694. The temple is also an ideal Qingming escape because here one can burn joss sticks at the altar in tribute to the deceased. Within the temple, visitors can appreciate the soothing atmosphere of birds singing, streams flowing and flower blossoming; don’t forget to pause and appreciate the wisteria growing here has blossomed every year, for 800 years, in April. For more flowers, step out to Hongluo Mountain to the north, where lilacs, roses and peonies flourish. Directions: Take bus No. 936 from Dongzhimen station to Hong Luo temple. For mountain hiking fans who do want to take the chance to get off their bums, the holiday is a good chance to head for Ling Mountain in the western suburbs of the city. Located at the northwestern side of Mentougou, it is 122 kilometers away from the city center. Ling Mountain is the highest in Beijing’s vicinity, at 2,303 meters, and is home to up to 1,000 types of wild plants, making it a paradise for animals such as peccary, rabbits, fox, goats and domesticated yak. Ling Mountain is also abundant with old historical remains like broken cave temples and beacon towers, making it great for exploring. With everything from these historical remains to plants that grow in both tropical and fridge zones, this mountain is like a museum of natural history, luring campers who like to call the area “little Tibet.” Take note, however: this adventurers’ paradise is also fraught with risks, and every year climbers lose their way and die of hypothermia or expo-sure. Be careful, or it’ll be your grave they’re sweeping next year. Directions: Take bus No. 929 branch line from Pingguoyuan subway station to Shuang Tang Jian. If the Ling Mountain is too wild and Hong Luo Temple too “popular,” the natural middle ground can be found at Shuanglongshan forest park, Changping District, 50 miles from the city center. Get close to nature while enjoying a variety of activities, including fruit and vegetable picking in the eco-environmental center and learning from guides how to survive in the wilderness. For something you generally cannot do within the city limits, go chase a mountain chicken (an actual activity) at one of the local chicken farms in an amusing diversion to get slackers to shake a leg and get some exercise. If chasing birds is too active for you, how about collecting their eggs? These particular chickens subsist on bugs and worms they find in the mountains, rather than chickenfeed; as a result, their eggs appear greener than what you’d pick up in the grocery store. There’s nothing like pursuing wild fowl to rally the appetite, so at the end of the day, tuck into appetizing farmhouse dishes served in the Shuanglongshan folk-custom vacation village, made with local mountain ingredients. It may be basic fare, but for urbanites who subsist on greasy food every day, a healthy change is a big holiday pursuit indeed. Directions: Take bus No. 345, 845 or 919 to Changping District, and change to bus No. 5 to Shuanglongshan. This entry was posted in Chinese Culture and tagged Qingming Festival, Tomb-sweeping. Bookmark the permalink.